It's easy to understand why so many people have been tempted by the futuristic-looking foc.us brain stimulation headset. The manufacturers promise their product will increase brain speed and plasticity and improve mental abilities such as working memory. What's more, the device uses a technology that's usually described as "non-invasive" – transcranial direct current stimulation, or tDCS for short – to send currents apparently safely into your prefrontal cortex. There is ample lab research to suggest that tDCS can have cognitive benefits (although a recent review questioned such claims). However, the foc.us device is not exactly the same as the devices used in this past research, and experts in the field have called for more direct investigations of commercial tDCS products. Others have warned that the biological effects of the technology (altering brain cell activity) shouldn't really be considered non-invasive at all, and that the long-term effects of the devices is unknown. Now a new study has just been published in Experimental Brain Research that directly tests the effects of the foc.us headset on participants' working memory. Note, this study was on the original foc.us headset which was on sale for several years, but which late last year the company replaced with its version 2 product. Laura Steenbergen and her colleagues assigned 12 participants to receive brain stimulation from the foc.us headset for 20 minutes prior to completing a working memory task; 12 others received stimulation "online", which means it was applied during the working memory task. 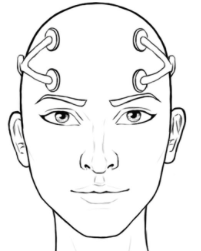 The headset was worn precisely as the manufacturers instruct, with two electrodes placed on each side of the front of the head (see image, right). Each group conducted a genuine brain stimulation session, and also a "sham" session in which the device was only switched on for thirty seconds and then switched off. Participants couldn't tell which session was real and which was sham. The working memory test was a variant of the widely-used n-back task, which involved watching a stream of letters on-screen and looking out for when the current letter matched the letter shown two items earlier (in the easier version of the task), or the letter shown four items earlier (in a devilishly difficult version of the task). This is a test of working memory because it requires that participants keep track of the history of prior letters while at the same time paying attention to new letters. The take-home finding is bad news for foc.us users and highlights the need for more research on commercially available brain stimulation products. In the active stimulation condition (online or offline), participants actually spotted fewer of the target letters in both the easier and more difficult versions of the working memory task (75 per cent accuracy versus 78 per cent, on average; a statistically significant difference). Meanwhile, reports of uncomfortable sensations such as burning at the electrode and headache were higher in the stimulation condition than in the sham condition. At least in this investigation, the brain stimulation was all pain and no gain. "foc.us is just one example of a device that can easily be purchased and, without any control or expert knowledge, used by anyone," the researchers said. "The results of our study are straightforward in showing that the claims made by companies manufacturing such devices need to be validated." Note: The manufacturers of the foc.us headset have published a response to this study.